BMWC’s industrial construction work falls under all forms of project-funding approaches, and often contains flexible work contract options. We offer shared-savings and incentive-based contracts that reward benchmark achievements in areas including safety, cost, scheduling and quality. Capital: Capital project funding refers to work that is approved and allocated for financial support outside of the typical day-to-day operational budget of the client facility. Grassroots projects, green field sites, brown field sites and production capacity expansion normally fall under this category. Maintenance: Maintenance funding comes from the portion of the client facility budget set aside for the normal routine maintenance and upkeep in facilities, property and equipment. 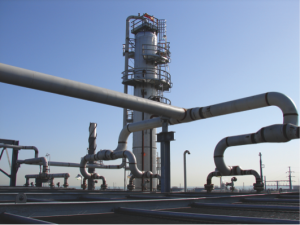 We routinely handle these types of projects, and they often require us to maintain process piping systems, power generation equipment and structural plant facilities and components on a contractual basis. Major Turnarounds, Shutdowns and Outages: These three terms are used interchangeably within the various industries in which we work. They refer to major events that often mean an entire industrial facility (or operating unit) will shut down for a complete overhaul on extremely tight schedules, and can last days, weeks or even months. Because our client’s production stops during these events, BMWC’s work is of a critical-path nature. We know that every hour lost potentially cuts into our clients’ ability to manufacture their products. While these events can also be an ideal time for capital improvements to be made, we take our commitment to predetermined outage time seriously, and understand that extended shutdowns can hurt our clients’ profitability.